Conforming – Fannie Mae. Lenders are required to use the greater of 1% of the outstanding student loan balance or the actual documented payment for the student loan. If the actual documented payment is less than 1% of the outstanding balance, the lender may use the lower payment assuming the loan will fully amortize with no payment adjustments. Conforming – Freddie Mac. Freddie has very recently changed their guidelines. If there is no payment being reported with a student loan (the loan is deferred or in forbearance), then Freddie will use 1% of the balance of the student loan as the payment. FHA is getting ready to toughen up it’s guidelines for student loans effective with FHA case numbers assigned September 14, 2015 and later. The new guidelines will factor a payment for all deferred debts, including student loans. Student loans will require that the lender use the actual monthly payment or 2% 1% of the outstanding balance, if there is no payment due or the payment is not available. Borrowers considering FHA loans who have student loans with deferred payments have a few weeks to get an FHA case number and not have calculate the debt into their qualifying ratios. 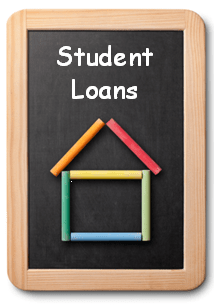 VA mortgage loans require that the student loan payment be counted into the qualifying ratios IF payments are currently due or will be due within 12 months of closing. If the borrower can prove that the student loan will not have payments for more than 12 months following closing, then the payment may not be calculated. USDA also requires that a payment be factored in the debt to income ratios regardless of if the student loan is deferred or in forbearance. The lender must use the actual payment for the student loan. If no payment is reported or due, then USDA requires that 1% of the student loan balance be factored as the payment. Remember, mortgage guidelines change constantly. Check with your local licensed mortgage professional to see what program may suit your financial needs. If you are considering buying or refinancing a home anywhere in Washington state, I’m happy to help you with your mortgage needs.